Joe Tacopina of Chesire Academy prepares to kick an extra point. Over the last few years, something that always seemed fairly obvious has become more and more accepted among American football coaches: soccer players make the best kickers. Sure, it's not very glamorous to transition from the star of one team to the guy who barely sees the field for the another, but for Temple Owls commit Joe Tacopina Jr. and others like him, it may be the smart move, one that can lead to bigger and better things. Tacopina, 18, is a senior at Chesire Academy in Connecticut, and despite not playing football prior to his junior year, he was being scouted by top football schools like Alabama and Miami, and received offers to, among others, Nebraska and Temple, where Tacopina will join the Owls as a preferred walk-on. So what made this former soccer player decide to give kicking the ol' boarding school try? Teenage curiosity, and a bit of peer pressure. "I was always interested in doing it," Tacopina recently told PhillyVoice. "A couple of my friends – Tarik Black, who is at Michigan, and C.J. 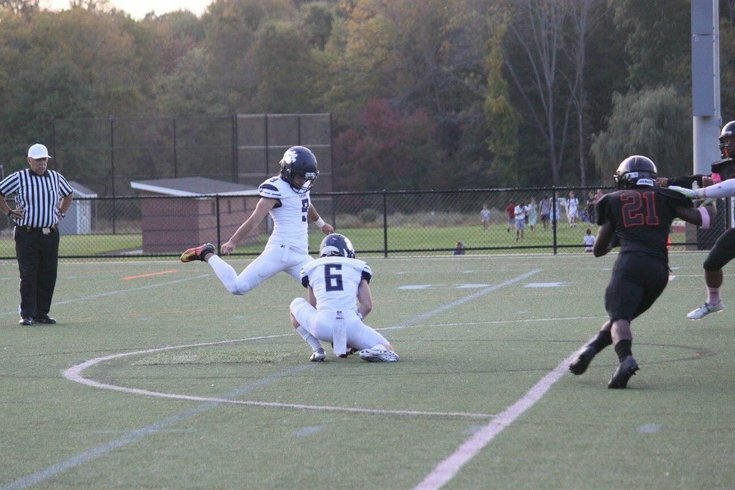 Holmes, Notre Dame – they were on the [football] team at the time and they wanted me to go out there and give it a try, because they needed a kicker. They were actually the ones who got me to do it. So I went out there in khakis and no shoes, and I hit a 40-yarder. They told me I should keep going with this, so I did. Once I started, I immediately started working with Ricky Krautman, the kicking coach, who kicked at Syracuse and he was able to get me going with the whole process." But to hear Tacopina describe it, there wasn't really much of a process. He never kicked off a block, like many high school kickers, and since that's not allowed at the next level, it already put the newcomer ahead of many of his peers. Although he didn't get a chance to kick many long field goals in games – "We scored a lot of touchdowns," Tacopina said, "so I must've kicked 50 extra points" – he certainly has the leg for it. Nearly all of his kickoffs went out of the back of the end zone for touchbacks. Within a year, Nick Saban – yes, that Nick Saban – would be pulling Tacopina out of class to have a word with the suddenly-hot recruit, something his father, Joe Sr., struggled to believe when he called to share the news. "'The Alabama coach? He came to Chesire? For you?" And while that's enough to make any father proud – and make no mistake, this father is extremely proud – there's one tiny reason for disappointment in his son's decision to switch from soccer to football. He was kind of hoping Joe Jr. would follow him into the family business. Well, sort of. 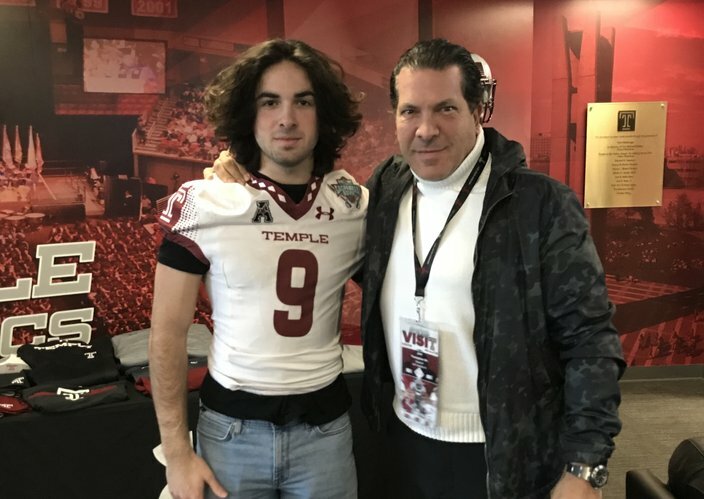 Temple signee Joe Tacopina, Jr. and his father, Joe Sr.
See, we left part of this story out. Joe Tacopina Sr. is a well-known defense attorney from New York. He's represented several famous clients, including Alex Rodriguez, and has worked on some truly amazing cases. Seriously, go look at some of these civil and criminal cases, which have involved people from Michael Jackson to the Prince of Monaco to rapper Sticky Fingaz (and that's just the tip of the iceberg). More recently – and of the most relevance to Philadelphia – Tacopina represented Meek Mill in his successful effort to have a parole violation overturned after spending months in prison. But law is not the family business we're talking about. Tacopina is also the chairman of Italian soccer team Venezia F.C. and openly admitted that he'd hope his son would some day play for the club. When he first purchased the Venice team out of bankruptcy in 2015, it was in Serie D, the lowest tier of Italian professional futbol. But after being promoted each of the last two years, Venezia has a chance to do something no other club has – with three games left to play, they're closing in on promotion once again, which would take them all the way to Serie A, the top level. Unfortunately, Tacopina won't be capping off the season by signing one of his five children to a rookie deal. Still, a college education and the chance to play professional football – like Brandon McManus, the North Penn product who kicked for Temple and kicks for the Denver Broncos – isn't too shabby, either. "Coach Collins sat down with me and my dad for like 30 minutes. That means something," Tacopina said. "It was awesome just to see that they really cared about every recruit. And just the opportunity. I'm new to [kicking] and other schools that wanted me to come, they wanted me to compete right away. I didn't want to do that. I mean, I'm willing to do that if they want me to, but I'm new to kicking. "I know Adam Boumehri is there now and is going to be the kicker for the next two years. ... So I don't mind sitting behind a good kicker like him and kind of learning." "Coach Collins really threw all his eggs in Joe's basket," he said. "And I think that was the part that really made it seem like this was the place to be. They only recruited Joe. They wanted him and they wanted him badly. And they made him feel that way. That's always nice to feel. Obviously Miami did [too], and so did Nebraska, but Temple just felt different... Nobody made us feel like family the way they did." Recently, the father and son attended the Owls' spring game, held on campus in April. And on the way home, they stopped to see a friend who, at the time, was still working on his release from prison. "We went to visit Meek after the game," Joe Tacopina the lawyer said, adding that the Philly rapper has already offered to speak to the team at some point before next season. "Meek said to Joe, 'Listen, you just be careful in this city. With your first name and your last name, since it's the same [as your dad's]. You show up late to class, and you're going to get two to four [years].' ... But [Joe's] his own person and can stand on his own two feet. I'm very proud of him." And if he hits a big field goal for the Owls? "He won't be the son of Meek Mill's lawyer anymore," he said with a laugh. "I think in short time, I'll be the father of the Temple kicker, not the other way around."